Zach Ruff, dean of academics and student life at Downingtown STEM Academy in Chester County, had a heated argument with teen anti-abortion activists last month. More than 20,000 people have signed an online petition defending the high school administrator. More than 20,000 people have signed an online petition defending a Chester County high school administrator who had a heated argument with anti-abortion demonstrators last month. 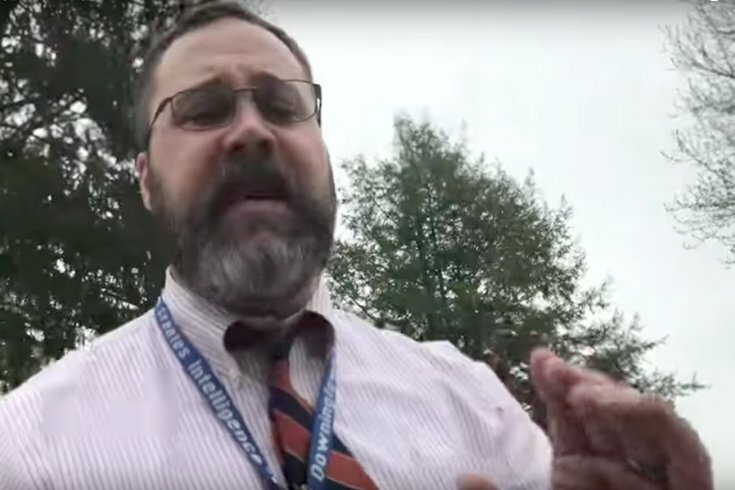 Zach Ruff, dean of academics and student life at Downingtown STEM Academy, was placed on administrative leave after video surfaced last week of his exchange with teenage members of Project Frontlines, a Christian activist network, on a sidewalk outside the school. The video shows Ruff telling the demonstrators to leave school property before engaging in an argument about abortion. At one point, a protester tells him he should "turn to Jesus Christ." Ruff responds by saying "Listen here, son. I am as gay as the day is long. I don't give a f*** what Jesus tells me about what I should and should not be doing." The incident occurred April 21. Social media users claiming to have witnessed the confrontation said the demonstrators were displaying graphic signs with photographs of aborted fetuses. The 18-minute video shows that the group remained on the sidewalk and did not disrupt traffic. A group of Downingtown STEM Academy students launched the online petition, which defends Ruff as "a crucial and valuable member of the STEM community." The petition claims Ruff has fought to ensure his students have a safe and comfortable learning environment. "His spirit in the school is a large part of what makes the STEM Academy great and thrive," the petition reads. "He is always trying to make this challenging institution better and is incredibly effective at his job. Upon placing Ruff on administrative leave, The Downingtown Area School District apologized for his actions in a statement, saying his "conduct does not represent the values of the school district or the respect we expect our employees to show for the civil rights of others." Newsweek recently named Downingtown STEM Academy the third best high school in Pennsylvania and the 58th best high school in the nation.